Spacious, 5 bedroom, 2 1/2 bath log home with 2800 sq. ft. of living space located at 93 Will View Rd. in Bethel, just 2 miles to Sunday River Ski Resort. 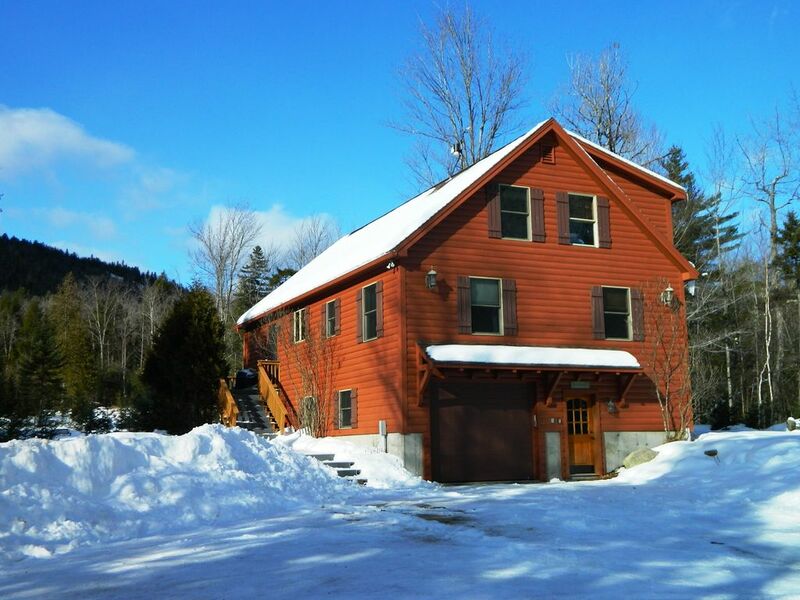 Privately situated on 8 acres with a snowmobile/cross-country ski trail just outside your doorstep. Local restaurants/bars, endless miles of trails (including access to main corridor) are all accessible from trail on property. The great room features a wood burning stone fireplace with beautiful views of Locke Mountain. Enjoy the scenery outside in the 6 person hot tub located on the wrap around deck. Additional family room in the lower level with a gas stove. The heated garage is set up as a game room featuring a ping pong table. Great stay at the Backview! The home was clean and well put together. We would definitely stay here again. Located in the middle of everything in town. This place is great. Very well maintained. The owner is there for anything you need. Everything worked, close the mountain, the good Apres bars: would rent again. My group was made up of young 30 year olds. Quality getaway in a quiet location. Very nice house in a quiet location. Well maintained inside and out with everything working including the hot tub, entertainment systems, and amenities. House is between Sunday River and town so it was very convenient with quick access to skiing and restaurants. Owner was quick to respond with answers to questions and was easy to deal with. Would definitely stay here again. This house was absolutely perfect. The house is new, clean, and has all the amenities one could ever ask for. The place is a 5 minute drive to Sunday River which makes its location great as well. The hot tub and ping pong table were a hit. Best part was the kitchen - lots of space to prepare food, a double oven, and a backup refrigerator in the garage. David was a pleasure to work with. Backview is a beautiful, cozy home to stay in with plenty of room for 2 or 3 families. This house also had everything you could possibly need and was only 5 mins to Sunday River! David was excellent to work with too! 2 Premier golf courses (Sunday River Golf Course and Bethel Inn Resort) within 5 minute drive from house.